Movie: "The Beyond" / "...E tu vivrai nel terrore! L'aldilà"
A woman inherits a hotel that she is fixing up. What she doesn't know is that it was once a haven for witchcraft and was built over a doorway to hell. Usually, inheriting a home is a good thing...unless you're in a horror movie, then your house is surely haunted or has some dark past that will probably come back to kill you. 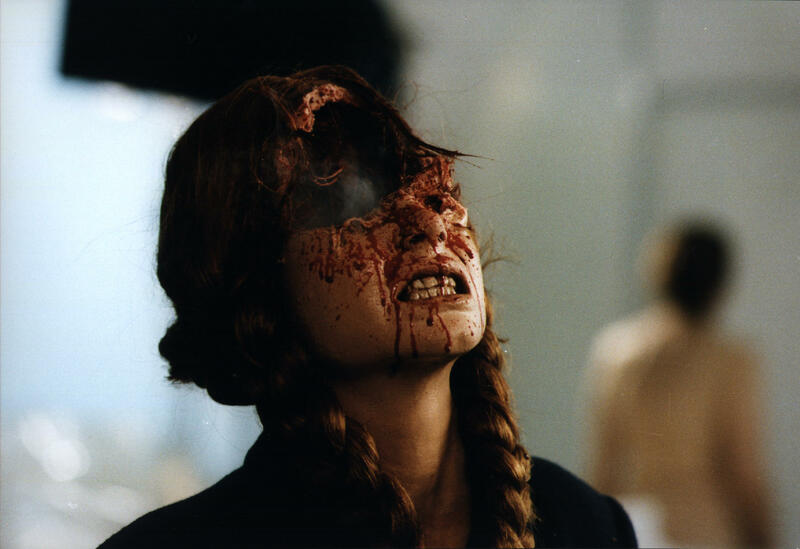 "The Beyond" is directed by famed Italian horror director Lucio Fulci. He has helmed numerous gore-filled films like "Zombi 2," aka "Zombie," "City of the Living Dead," and "The New York Ripper." 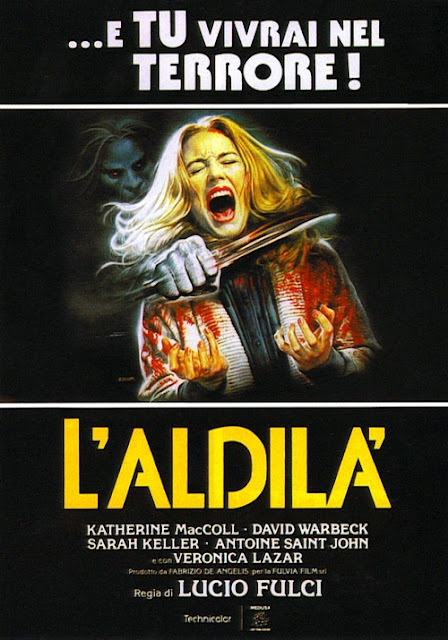 Fulci also helped write the screenplay along with Dardano Sacchetti and Georgio Mariuzzo. The story centers on a woman from New York named Liza Merril (Catriona MacColl), who has just inherited the Seven Doors Hotel in Louisiana. She plans to renovate it and reopen it. Unbeknownst to her, the hotel sits on top of the Seven Doors of Hell and that decades earlier, a lynch mob murdered an artist they believed to be a warlock in the basement of the hotel, which inadvertently opened one of the gates and allowed evil and the dead to flow in through the hotel. Now, her renovation work is drawing the deceased into our world. Lucio Fulci has written a lot of screenplays and has directed a lot of films, but if you were to ask us, we'd have to say that storytelling is not his strong point. "The Beyond" doesn't have a very tight narrative. In fact, it's a bit disjointed and hard to follow. We found it difficult to understand and remember who each character was and what their importance was to the story. 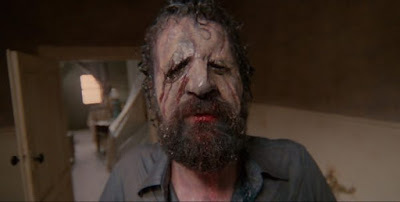 What Fulci does do well, however, is make striking, extremely graphic visuals. Some of the deaths in this film are absolutely disgusting and downright disturbing, but that's what they were going for, and damn it, we're all in. This is a horror film after all. The effects are a bit dated and don't necessarily look realistic, but that doesn't make them any less effective. Goo and blood frequently ooze out of eye sockets, skin tears from the bone, and heads melt as though they were made of wax. It makes us shudder to even think about the grossly awesome stuff in this movie. It is hard to comment about the acting in any Italian horror movie because, at the end of the day, the on-set performances of the actors are always dubbed over in post-production in one language or another depending on its country of release. Even if it wasn't, most of the physical performances are a bit overexaggerated, making the entire product feel sort of cheesy at times. That being said, we really, really dug "The Beyond." This was our first experience with Lucio Fulci, and needless to say, we can't wait to watch more of his (we hope equally disgusting) films. We were drawn in by the imagery this movie offered from start to finish, which made for an entertaining, gruesome viewing experience.